Burnley winger Robbie Brady needs knee surgery and faces a "substantial" time on the sidelines. 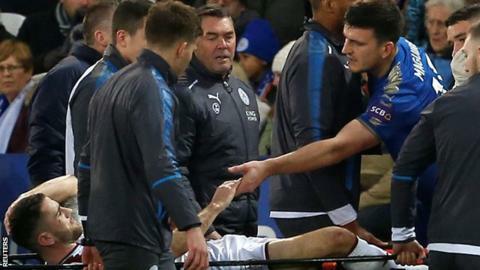 Brady, 25, was injured in a collision with Leicester City defender Harry Maguire half an hour into Saturday's 1-0 Premier League defeat. Play was stopped for several minutes before the Republic of Ireland international was carried off on a stretcher with his leg in a brace. Clarets boss Sean Dyche says Brady has suffered a patellar tendon tear. "He will be out for a substantial recovery period," added Dyche. "He will be given all the time and care he needs on his recovery and supported throughout." Brady joined Burnley from Norwich in January in a deal worth up to £13m. He has played in all 15 league games this season for the Clarets, who are seventh in the table.